The Hunter River Retreat has 5 self-contained mountainside spa cottages with breathtaking views over looking the valley and Hunter River. If you are looking for rustic Australiana with iron roof and cedar cottages with bush BBQ's this is it. All cottages are fully self contained. Ironbark Lodge is a great place for large groups to gather with its large indoor & outdoor entertainment areas. Please note this listing is for booking all of our cottages for up to 30 people, if your group is smaller please send through an enquiry and we can tailor a quote for only the cottages needed. Our cottages include the main residence Ironbark Lodge which has 4 bedrooms and sleeps up to 10 people, Rockhouse, Bluegum & Cedar Cottages which each have 2 bedrooms and sleep up to 6 people and Olive Cottage is a studio style and sleeps 2 people. All the cottages except Olive have private jacuzzis , whilst Olive has a spa bath. Each cottage has air-conditioning , a wood fire , large verandahs and BBQs. 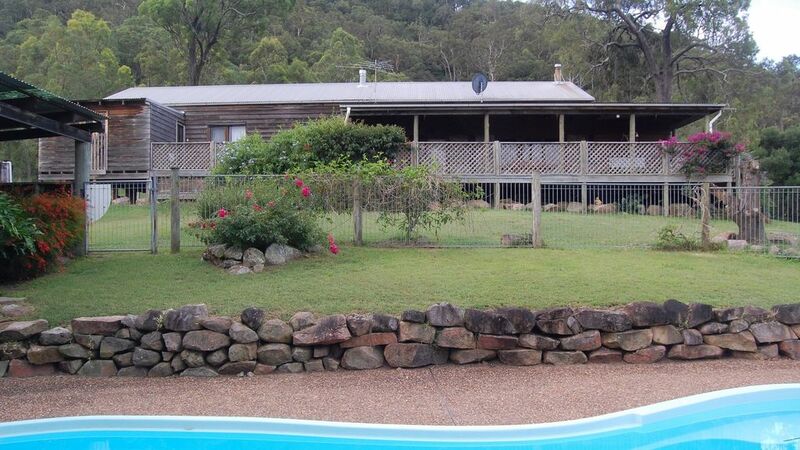 We have a swimming pool, fishing in the Hunter River and bushwalking on the 110 acres. Hunter River Retreat is close to Historic Morpeth and 20 minutes to the Lovedale vineyards and 25 minutes to Pokolbin. An easy drive to Newcastle, Nelson Bay, Barrington Tops and Wollombi. Come and experience the total Australian experience on the ranges at Rosebrook. Please note that we do allow various parties (including bucks weekends) at The Retreat , but these need to be agreed prior to booking. There is a maximum of 30 guests only. Loud noise and music needs to be minimised after 10.00 pm. Contact number during your stay, if different from enquiry. Names of people who will be staying at The Retreat. Each cottage except Olive has its own private jacuzzi. Our large family came together to celebrate a 50th and 60th Birthday. Ironbark Lodge was a fantastic place to celebrate the night. Everyone enjoyed their stay. All the cabins were perfect. Plenty of room for all. Would recommend the property very highly. Glad to hear that the family birthday celebrations went well. Perfect for a weekend away with the girls. Relaxing in the hot tub and taking in the scenery! A great property on a great piece of land. Was perfect for a large group of friends party. The horse was also very friendly! Absolutely loved our stay at Hunter River Retreat. Every cottage is amazing with the added bonus of individual hot tubs, log fires & beautiful scenery. We are a group of women who go away a couple of times a year. We were all able to fit with most of us having our own rooms. We loved the views and tranquillity and the beautiful large veranda overlooking the valley. The property had everything we need including a well equipped kitchen and lots of spaces to talk and relax. The spa was an extra treat. Would definitely go back. The Hunter Valley wine region is only a 20 min drive away. A scenic drive through the Australian countryside will take to you to some of the best known wineries in Australia. There you can sample the flagship Hunter Valley Semillon and Shiraz, which captures the spirit of the Hunter Valley in a bottle. Maitland is also only a 10 minute drive ,with its full range of shopping, business and civic functions as well as education, cultural and recreational services. Built on the banks of the Hunter River, which brought life and trade to the early city, Maitland is one of the oldest heritage rich regional centres in Australia.